Protest posters on the gates of Nestle’s contraversial purchase of a well property in Central Wellington that the community wanted for its own needs. 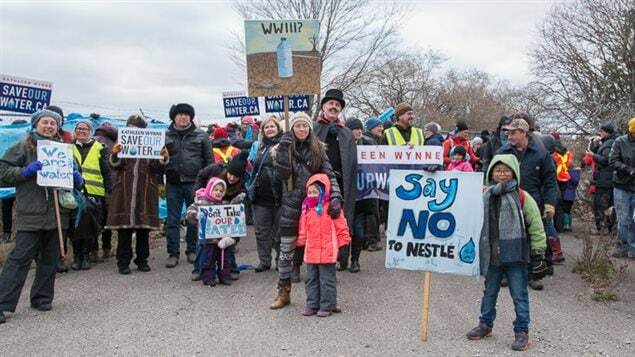 People in and around the west-central Wellington County in Ontario held a protest this weekend at the controversial Nestle wellsite of the Middlebrook Rd. property in Central Wellington, near Guelph. The site had been sought by the county for its own needs and put in an anonymous bid for the property, but Nestle which operates other extraction sites in the area, had a previous conditional offer on the property and when learning of the bid, exercised its right of first refusal and purchased the Middlebrook property. The group of citizens, environmentalists, farmers and others has long been concerned about commercial extraction of vast quantities of acquifer water by commercial operations in the province.. The vast amount of water is extracted for pittance amounts of permit fees, and then bottled and sold in plastic containers that usually end up as waste littering the landscape, lakes, and oceans. Previously the fee was a mere $3.71 per million litres of groundwater. Strong public protests resulted in the provincial government putting a temporary moratorium on new or expanded permits and raised the fee to $503.71, per million litres, which most people still consider to be far too low. Most groups in fact would like such commercial extractions stopped altogether. 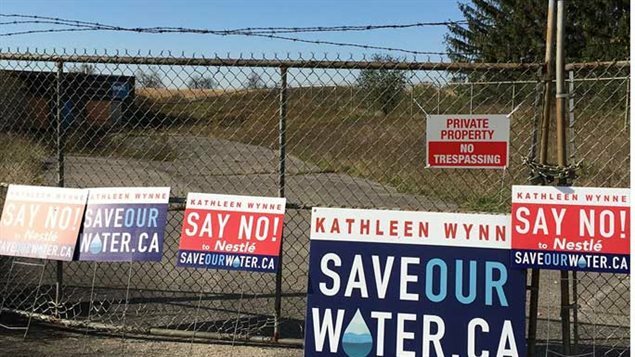 There are currently nine expired contracts with seven extraction companies in the province, which are still in operation and which can extract up to 7.6 million litres per day, although the Ontario environment ministry says they only pumped about half that amount. One billion litres extracted on expired permits. Nestle alone can pump some 4.7 million litres out of Ontario acquifers, every day. 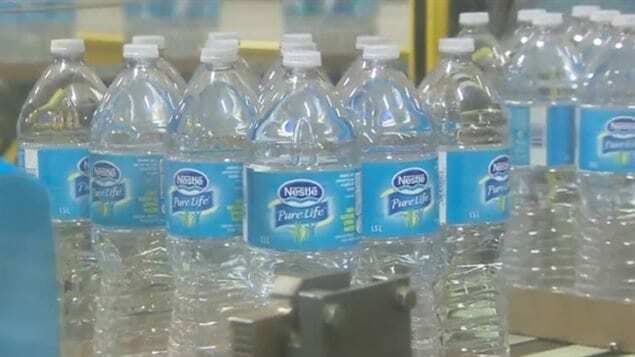 Today the Nestlé operation will bottle its one billionth litre of water since the permit for the Aberfoyle well expired last year on July 31st , 2016. Another well permit in Erin, expired on August 31 of this year. Various concerned groups say the government is allowing continued extraction even though the permits are expired. The government says it is giving the companies time, up to 18 months to amend their renewal applications in order to be compliant with new rules. The Canadian Bottled Water Association says they’re being unfairly targeted as they only take 0.2 per cent of all groundwater. Meanwhile Nestlé is coming under fire for something called “bluewashing”. 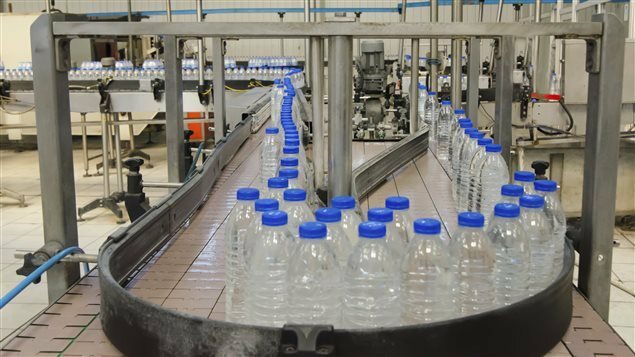 In October, Nestlé announced it was planning to certify 20 factories with the Alliance for Water Stewardship (AWS) in Africa, Asia, Canada, Europe, Latin America, and the United States. “It’s outrageous and laughable that Nestlé is claiming that its water bottling is sustainable,” says Maude Barlow, Honorary Chairperson of the Council of Canadians. “Nestlé is not only a member but also a founding partner of the Alliance for Water Stewardship, which Nestlé is seeking ‘certification’ from. Certifying Nestle makes the whole AWS scheme essentially meaningless. I think communities around the world will see right through Nestlé’s blue-washing:. They are looking the same in Brazil. By the way, the EU in Brussels allowed today that Glyposat can go on in Europe to destroy our health and environment for more five years. Angela Merkel said YES to Glyphosat.